Home » Posts Tagged "Electric Showers"
Bristan have launched a new range of electric showers in fact four ranges in total, the Smile, Glee, Joy, and Bliss. I think they have done a very good job with clever ideas that should make them a best sellers. They are price competitive and look great, they can replace most other electric showers with there 5 point entry for both water and electricity, and they come with a variety of different power ratings. All ranges come complete with a riser rail shower kit and a hose and handset. The Smile range is only available in white and with either a 8.5kW or 9.5Kw prices start from just £85.00. The Glee range (pictured left) has the addition of a digital temperature display and is available in 8.5kW, 9.5kW or 10.5kW prices start from just £110.00. If you wish to see the complete range on special offer the visit Tapstore by clicking here. Electric showers here start from £66.00 for the Galaxy G7000 and go up to the Bristan thermostatic electric shower 10.4 Kw for £391.00 a big price difference so what do you get for your money? Well the answer is simple. 2, Temperature stabilization – electric showers are quite temperamental and with better quality showers you get better performance control. 3, Looks – you will always pay a premium for a better looking shower. 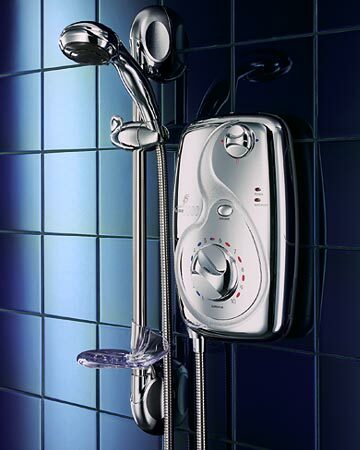 4, Controls – some electric showers will have knobs to turn and control the shower flow and some will have more expensive buttons which will be electronically controlled. 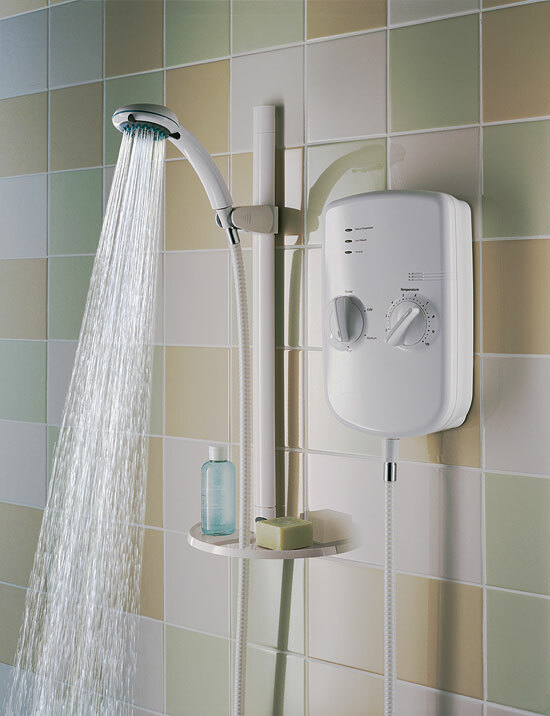 It is important to note with all electric showers the faster the flow the cooler the water they are essentially an instantaneous water heater so paying more money for a unit of a lower wattage will not be a better quality water flow (Shower). To view the largest selection of electric showers whether it is for a new installation or a replacement at amazing prices click the link below. New Team have been making these showers for years now and are proven to be reliable work horses for many customers, they have been branded by the biggest DIY stores as Showerforce, and also more recently after being bought out by Bristan they have been in their retail book as well, but essentially they are all the same just with separate branding name on them. So if you want a decent electric shower then you need look no further than New Team showers for your bathroom or shower room. New Team Electric Showers are available in several different Kilo wattage versions from 8.5Kw, 9.5KW and 10.5KW. the come complete with shower head and hose with a stylish riser rail. They are also available in Matt Chrome as well as in white and chrome. Best buy for NewTeam Electric Showers 10.5Kw £188.00 from Tapstore.com or for the 9.5KW only £128.00 from New Team Showers . There are not too many chrome electric showers available at reasonable cost I have noticed the Galaxy Electric showers at Tapstore.com are really neat and not very expensive at all. There are three power options 8.5kw, 9.5kw and 10.5kw all for the same price of £136.00. 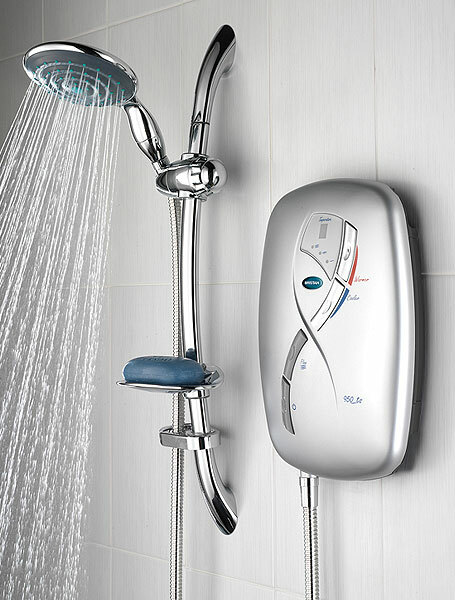 with a separate on/off control, variable power selector and a flow control, to give you a fully stabilized shower holding its temperature precisely. It also has a built in ‘auto reset’ feature in case of any heat overload to protect both you and your shower. You can buy this highly rated shower from Tapstore.com by clicking here.